Barrett Art Center invites you to their 30th Annual National Juried Photography Exhibition Photowork 2017 on January 21, 2017. Selected from over 800 entries, Photowork 2017 showcases 63 photographic works representing a full spectrum of subjects and styles. In addition, 3 Mid-Hudson residents have been selected to join the 42 other photographers representing 16 states: Photographer Mark Lyon of Marlboro, Karl Schmitz of Poughkeepsie and Marie Triller of Hopewell Junction. In celebration of 30 years of Photowork Exhibitions, the artwork was selected by a distinguished panel of 3 jurors: Isaac Diggs - a photographer and faculty member at the School of Visual Arts in New York City; Rebecca Morse - Associate Curator of the Wallis Annenberg Photography Department at Los Angeles County Museum of Art (LACMA); and Robert Stevens - former Photo Editor of TIME Magazine and faculty member at the School of Visual Arts in New York City. Jurors’ awards with cash prizes for Photowork 2017 will be announced at the reception. Come celebrate the 2016 Holiday Member Show in conjunction with the Solo Exhibition Ashokan Reservoir by artist Amy Rie McGuire in the Crenson Gallery at the Barrett Art Center. The Holiday Member Show features artworks all under 18 inches in size, while the Solo Show highlights an array of views of the Ashokan Reservoir where McGuire has lived for more than thirty years. McGuire makes and/or paints most of the frames for her paintings. Her greeting cards, calendars and a book will be available for sale during the show. A portion of the proceeds will be donated from these exhibitions to Holiday Helping Hands, a charitable giving program of the United Way of the Dutchess-Orange Region and the Poughkeepsie Journal. 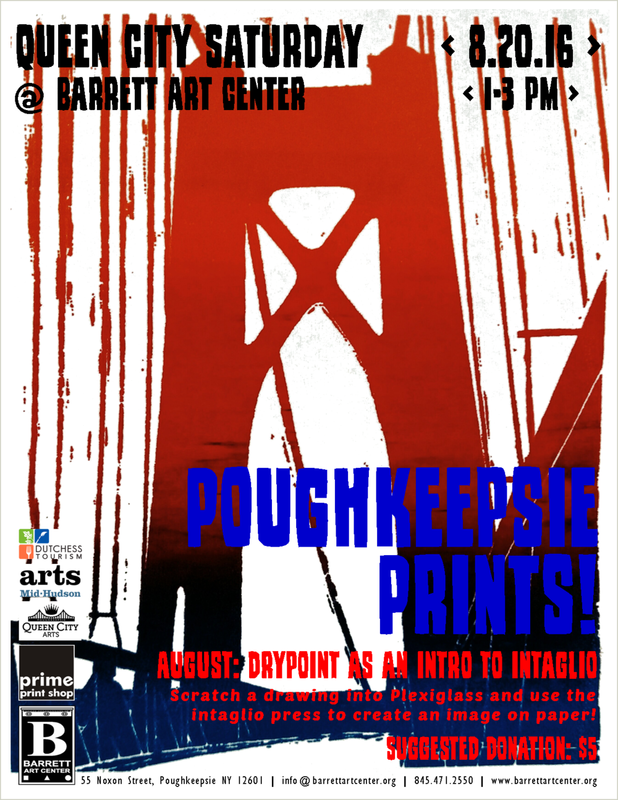 A prize drawing will feature note cards and artwork reproductions of works by and inspired by Thomas W. Barrett, Jr.
Artists of all ages and experience levels are invited to learn about the intaglio printing process and make their own dry point etchings with the Center's experienced instructor.